Bryan White hit the Ugandan social scene with a bang and within a few months of him splashing money to whoever could say his name, he was the number one selling being discussed on all local tabloids. It looked like he was going to be stuck in our faces for a very long time until something unexpected happened. He was arrested for attempted murder! 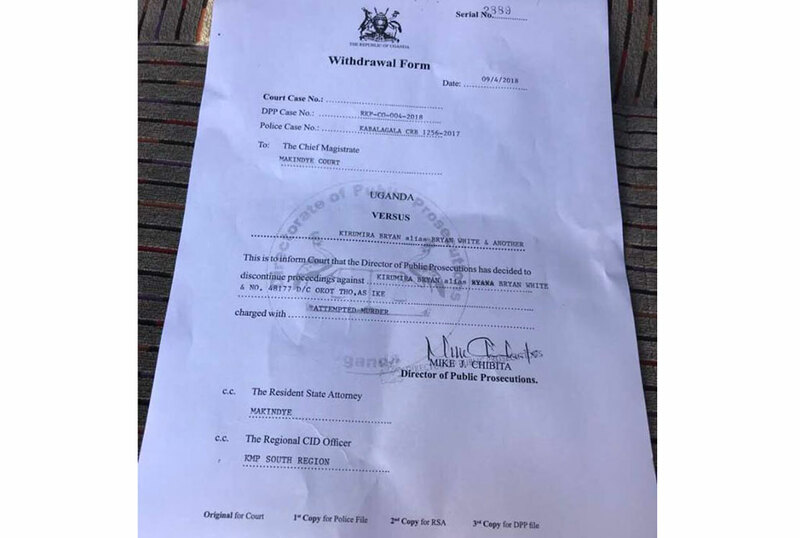 Right at the time when he was cementing his position in Ugandan social life, White and his bodyguard Thomas Okot were remanded to Luzira Maximum security prisons for attempting to kill Victor Bitwire, a neighbor to White. The duo were reported to have shot Bitwire on the night of December 13 last year in Munyonyo. White and Okot were incarcerated in prison as the case was being heard by court until January 7 when he gained temporary freedom as he was granted Shs20 million cash bail. 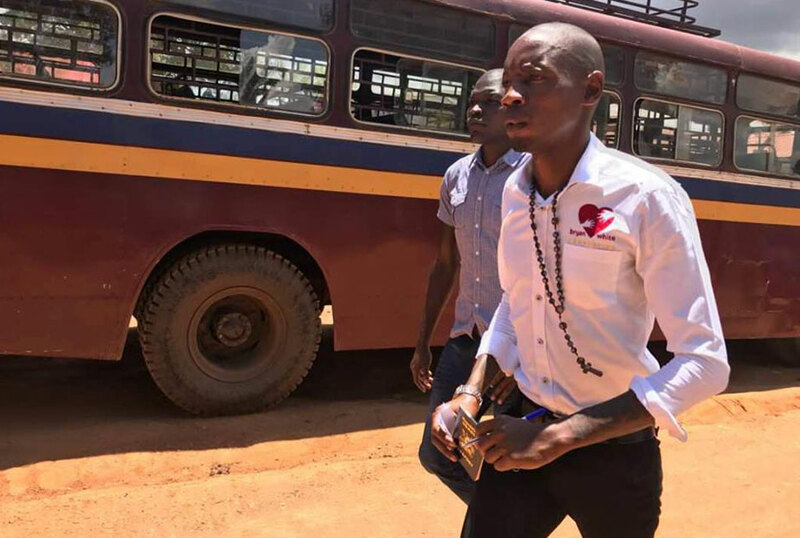 Since then, Bryan White has been in and out of court until this afternoon (March 10) when the Director of Public Prosecutions (DPP) Mr Mike Chibita dismissed the court proceedings against Bryan White. The dismissal of the court proceedings came after Bryan White reconciled with Bitwire on March 9 and he agreed to be compensated and settle things outside court. 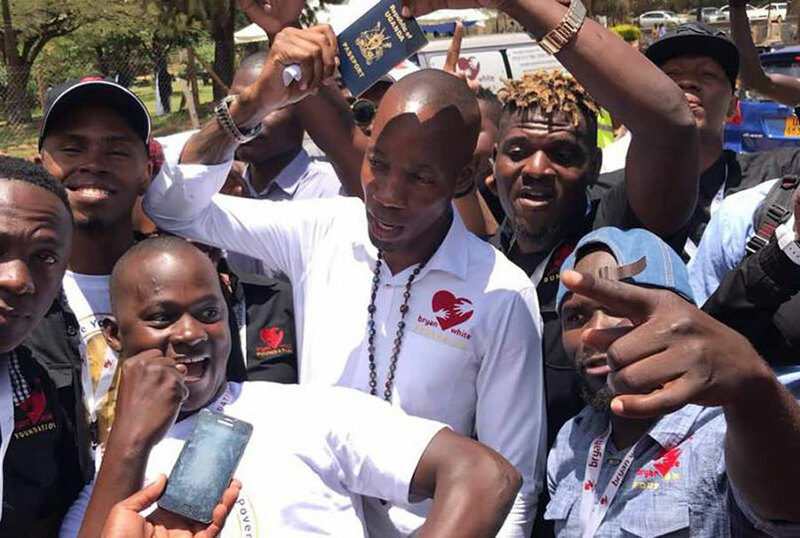 Upon his release, the socialite was seen outside court with some of the members of his foundation who include artistes and comedians. You may have wondered why Bryan White didn’t go with Weasel to London for a show and yet the two are nowadays inseparable. But it was because he did not have a passport at the time. It had been retained in fear that he would flee the country when court was still proceeding. It is today that White has gotten back his passport. In fact he was seen showing off his passport outside the courtroom today. However, had Bitwire turned down White’s out of court case settlement, then the self-styled tycoon would still have the case hanging on his neck and perhaps would end up being sent to prison for life upon conviction. According to the Penal Code, attempted murder attracts a maximum penalty of life imprisonment.